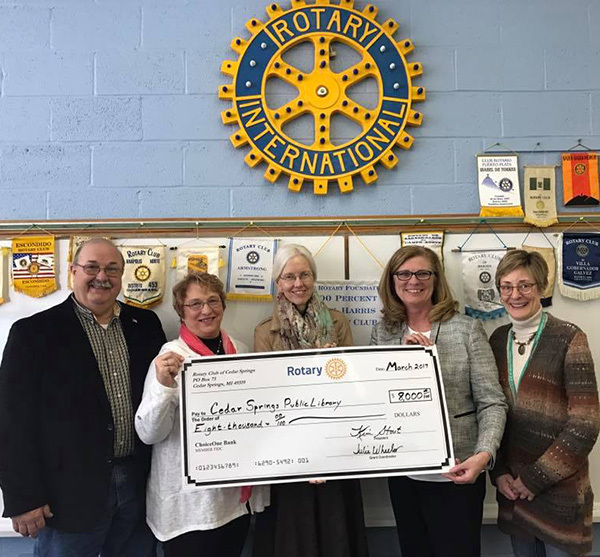 Tag Archive | "Cedar Springs Rotary"
North Kent Community Services (NKCS) has partnered with the Dorothy A. Johnson Center’s Community Research Institute at Grand Valley State University to complete a community needs assessment for northern Kent County. 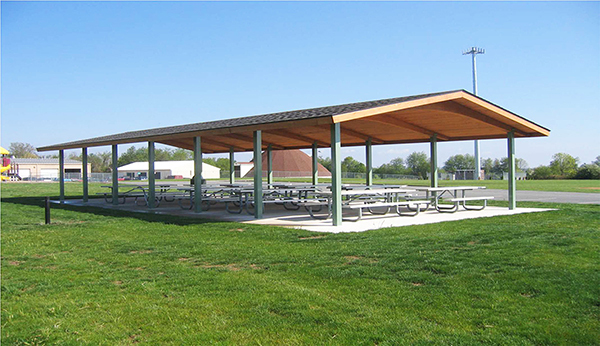 This initiative, funded in part by the Sparta Community Foundation, Cedar Springs Rotary, and Rockford Rotary, will give insight to how NKCS can best address the needs in our community. 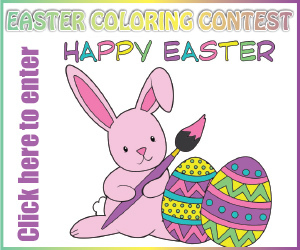 Wednesday, March 22 from 6:00 to 7:00 p.m.
Friday, March 24 from 10:00 to 11:00 a.m.
Friday, March 31 from 10:00 to 11:00 a.m. If you or somebody you know are interested in attending one of these focus groups, please call (616) 331-7585 to sign up. Attendance is limited to the first 30 people who reserve a spot. Those who reserve a spot and participate in any of these focus groups will receive a $20 Meijer gift card. 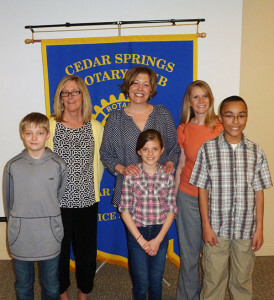 Pictured are the Cedar Springs Rotary 4-Way Test essay winners. From L to R: Sally Odren, Makenna Nichols, Jack Cairy, Analiese Van Harten, and Josh Trendt. Courtesy photo. The Cedar Springs Rotary handed out awards to students last week in their annual Rotary 4-way test essay contest. They invited fifth grade students from Cedar View and Creative Technologies Academy to participate. All essays were written in 200 words or less. Teachers chose the 2 best essays from their class and submitted them to the committee, which included Julie Wheeler, Carolyn Davis, Donna Clark and Bea Hesley. The students were then on their own to write the essays. And the students who won had a good grasp of what the committee was looking for. Out of 14 essays, they chose five. There were ties for second and third place. “We feel like these essays were the best ever,” said Clark. The two second place essays were about volunteering to feed hungry families. The third place winners wrote stories about how a community can work together to benefit one another, such as the fundraisers for the Rickers. The first place winner spoke about how things people say can be cruel, but we can choose to be inspired rather than let their words have a bad effect on us. The first place winner was Sally Odren, of Mr. Moleski’s class at Cedar View. She won $50. Second place winners were Jack Cairy, of Mrs. Kahler’s class, and Makenna Nichols, of Mrs. Miller’s class, both at Cedar View. They each won $25. Third place winners were Josh Trendt, of Mr. Moleski’s class at Cedar View, and Analiese Van Harten, of Mrs. Norman’s class at CTA. They each won $10. This is the ninth year that the Rotary has partnered with local schools on this project. 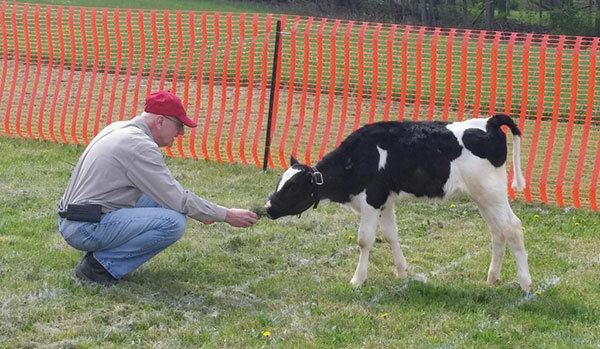 Rotary member John Rohrer with Ana the calf. The Cedar Springs Rotary Club conducted their Cow Plop Raffle on May 7 with the help of Ana the calf. The winners, thanks to Ana’s strategic aim, were Stacey Helsel, first place; Kurt Mabie, second place; and Amanda Gerhardt, third place. The Rotary Club would like to thank everyone that bought a ticket in support of the club’s good works programs. 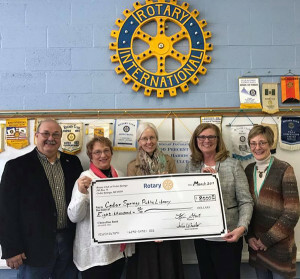 The club sold 816 tickets and raised $2,380, which will be used to send students to Rotary District 6290’s Life Leadership Conference in June. Jack and Marge Clark were recently honored at a Rotary meeting. Standing behind them is Rotary president Amanda Gerhardt. 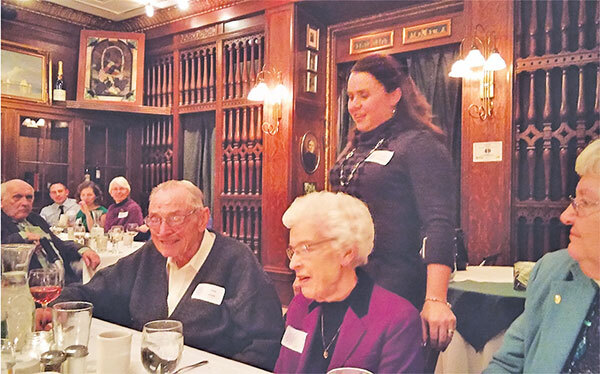 Cedar Springs Rotarians gathered at the historic Mangiamo Restaurant in Grand Rapids to celebrate the past and upcoming years. The Rotary club presented a special award to Jack and Marge Clark, with a $1000.00 donation to the Rotary Foundation in their name. 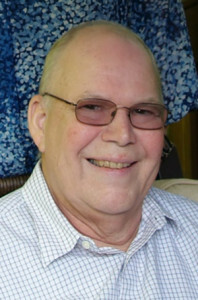 Jack has had 59 years of perfect attendance to weekly meetings, showing his commitment to the Rotary ideals. 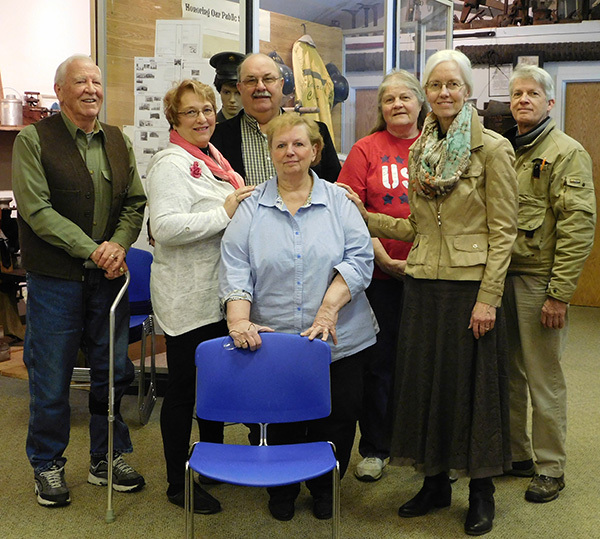 Marge has been a faithful servant to the Rotary effort to wipe out polio from the face of the earth. She has been painting pinky fingers purple as a fundraiser for many years. The musical group Perculators entertained the Rotary group following a delicious dinner. 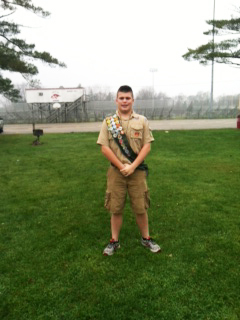 Coming in first this year was Martin Yakes, of Mrs. Kahler’s class. “We feel he withstood a great test of integrity and learned a great lesson. His essay is entitled “Truth or Dare,” explained Clark. Katelyn was given her award and $50. Second place went to Ashlyn Roberts, of Mrs. Latimer’s class. “She is a girl of great integrity as her essay demonstrates,” said Clark. She was given an award and $30. Jesse Nagle, of Mrs. Boverhof’s class, came in third place. “We appreciated how Jesse found his way out of a very sticky situation with honesty and integrity,” remarked Clark. He was given an award and $20.